Every family has a go-to dish…if not a couple go-to dishes. My dad really likes to make macaroni and cheese – not the box kind, although that is good, too. No, he makes his from scratch complete with macaroni noodles, milk, eggs, an assortment of fresh cheeses, and sometimes bread crumbs. Needless to say as much as my dad enjoys cooking mac & cheese, we enjoy eating it. Which is why, when my sister told me she was on her way from my parents’ house with a casserole of dad’s mac & cheese, I was floored. I actually planned our Tuesday night dinner around the mac & cheese – silly, no? Mac & cheese is, to me, one of those classic American dishes and family comfort foods that you can hardly get sick of eating. I don’t live at home any more so I rarely get it and don’t have the recipe, so I’m far from getting sick of it. For dinner, I planned a TV dinner – something I like to do fairly often. For my TV din-dins, I always make salisbury steak (a Rachael Ray 30 Minute Meal recipe – click) with a veggie, a starch, and a dinner roll. I don’t always make all the dishes from Rachael’s meal, but the steak is there and I try to hit all the food groups (or at least all the aforementioned groups). 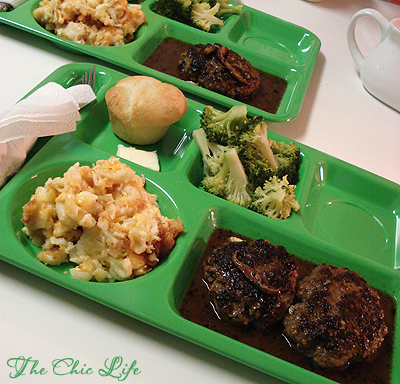 The salisbury steak is so good with that mushroom pan gravy…mmm! I’m not a big fan of mushrooms, mostly b/c of the texture, but I find the flavor enhances dishes, so I always add a wee bit when I’m cooking, though I usually never eat it. Dishes that require mushrooms taste almost empty without them, for whatever reason. So, I either mince the mushrooms so they’re so fine, I don’t realize I’m eating them (think beef stroganoff), or I cut them so big that I can pick them out. Anywho, steamed broccoli made a nice & healthy side veggie and the mac & cheese went perfectly with everything else. My sis and I kicked back, enjoyed our dinner and vegged out to another Tuesday night marathon of Cold Case. Anyone else watch that show? It’s addictive and really such a good show. The storylines are always so interesting and sometimes you really get to know the characters and even identify with them. Such a sad and intriguing show, but at least it’s fiction, unlike this one, which is also a good show, but more sad b/c you know it’s real. Anywho, the fiction Cold Case has a marathon every Tuesday night, which I’ve grown accustomed to watching with Bailey. Careful if you turn it on, though, b/c the shows are truly back-to-back. When one ends, the credits start rolling, then the credits move to the right side of the screen so they can fit the beginning of the next show on the left side. Get caught watching that first scene and you’re trapped! You’ll be up another hour…guarantee it. Unless you’re not easily sucked into an interesting plot like me. My curiosity keeps me up another hour and the show plays re-runs till midnight! It makes for a "too-early" Wednesday, but it’s worth it. I luvvvv mac & cheese! Sounds yummy! So….is the mac & cheese recipe a family secret or will you share? LOL – no pressure of course! Oh now that looks fabulous. I haven't gotten brave enough to do the whole homemade Mac & Cheese, but I do grab the velveeta shells & cheese (I know I know poor substitution) but then I mix my own extra cheeses (i.e. asiago, parmesan, gruyere – whatever I have in the fridge) and a dash of cayanne pepper. As for Cold Case – LOVE LOVE LOVE that show – Scotty is one of my faves but Reese popped the bubble when she said he films on the lot at her job and his family is forever on the set *LOL* cute but loses that Philly allure.